Shear-Flor Finishing – Offering concrete placing, finishing and formwork services in Edmonton, Alberta and surrounding area. Shear-Flor Finishing is part of MK Group of Companies, offering more than five decades of combined experience and expertise in all sectors of the construction industry. With more than seven million square feet of concrete slabs to our credit, Shear-Flor is an industry leader offering a diverse range of services to projects in the Edmonton area and Northern Alberta. 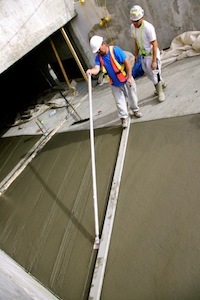 We specialize in concrete placing, finishing and formwork. No matter your project’s needs – functional or decorative – we can deliver the results you want! Our highly experienced team can take on any size project and is proud of Shear-Flor’s commitment to quality. Feel free to browse our website or contact us today!